I'm not sure there's a more important record to me. I mean, not necessarily in the obvious 'this influenced me'-way but much more generally. It's certainly the first album I treasured as my own. Sure there's something to be said about nostalgia, that maybe things develop an aura over time which somehow dismisses them from the usual critique. That's ok. The point is I still dearly love this record - still know every word, and in all likelihood this will never change. Like any great album it places you in time. It draws from your own private intimate experiences and actually feels personal. 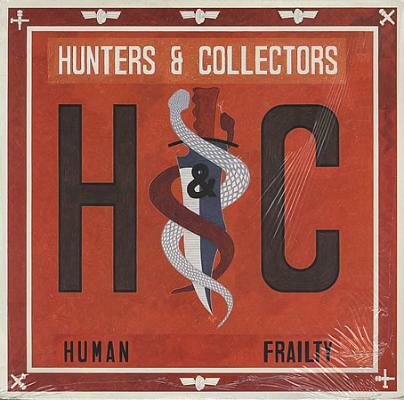 Hunters&Collectors are from Melbourne and so am I. I've never met them or seen them play live. I wouldn't even say I'm fluent in all their albums. Still, because of this one record I feel forever inextricably linked to them on a level that reaches far beyond mere notes, words and songs. Human Frailty has made that gargantuan leap from being a 'great album' or an 'album that I love' to MY album. Something that means more to me than anyone else around. Undoubtedly there are heaps of other people who love this record (it was a commercial success in Australia) but the point is, I don't know them. In that way it exists as something unique and particular to me. So meaningful in ways that can't easily be conveyed. Of course, besides all this, the songs are just tremendous. Great melodies and driving rhythms punctuated by an astute use of brass instruments. It's one of those albums that makes me imagine the recording as this kind of seamless ease of immediacy. Where the band knows the songs so well just because they've played them live down the pub for months beforehand. Of course this could all be wrong and the process may have been completely opposite but at this stage that's really beside the point. It exists exactly how I imagine it to exist.